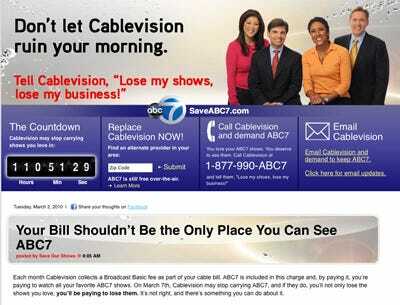 At about midnight tonight, 3 million Cablevision subscribers in New York lost their ABC signals. Disney’s attempt to get Cablevision to pay up an additional $40 million a year in new cable rights fees is at a standstill. But viewers are caught in the middle, with Cablevision subscribers in New York left without a live signal for the Oscars tonight, starting at 8 p.m. They will have to find another way to watch the Oscars. ABC will likely remain bullheaded in the fight so they can continue to negotiate higher fees with other cable providers like Times Warner Cable. News Corp. already won against TWC in their a Fox fight. We can expect more of these kinds of public fights over fees, with cable consumers getting punished with either pulled stations or higher cable bills in the end.